Saturday Night Clay Oval Racing. 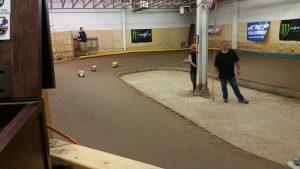 More Family and Sportsman fun with Amateur and break out class’s to provide good competition and fun racing. We run Stock Short Course, Pro Short Course, Amateur, Midget 4.7 (breakout), Coupe Classics (4.6 breakout), Classics (Traxxas based chassis/motor). Full rules in rules section. Registration closes 5:30, runs start at 6pm.